Rebecca is a proud Texan feminist who was born and raised in the southernmost region of the Rio Grande Valley. She graduated from the University of Texas at Austin with degrees in Rhetoric & Writing and Government and a minor in Women and Gender studies. 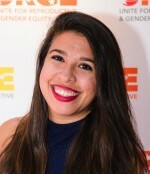 While in college, Rebecca realized her passion for gender equality, reproductive justice, and community mobilization and worked with youth in various educational and volunteer outlets. After graduation, Rebecca served as an Americorps VISTA with GENaustin (Girls Empowerment Network) before moving to Philadelphia to join the development team at WOMEN’S WAY. At WOMEN’S WAY, Rebecca spent two years focusing on providing access to resources for women and families, public education, and advocacy. Rebecca is extremely excited to bring her experience and devotion to social justice to the URGE team and her beloved red state. When she’s not adding to her intersectional reading list, Rebecca can be found cooking for her amazing friends, dancing at a live show, or playing with her wiggly dachshund, Samson.